Wet Vacs vs Carpet Cleaners: Which is more useful for carpet cleaning? Wet vacs or wet vacuums are able to suction out water and liquids. They are similar to carpet cleaner machines in that both will suction in water. However, wet vacs are different from carpet cleaners in that they do not have a mechanism for shampooing and scrubbing the carpets to agitate and separate the dirt (eg. pet hair, wine stains, dog urine, grease) from the carpet threads, before suctioning the dirty water into the machine. For most home users wanting to do some carpet cleaning, it is easier to get a carpet cleaner machine – basically a combo system that includes a brushing mechanism and a suctioning mechanism. Otherwise, you end up having to purchase a carpet brush and a wet vac separately. In short, you won’t be saving much money, if any, and it’s probably more troublesome. Using these two pieces of equipment is still workable for cleaning smaller spots, the stairs or for cleaning auto interiors. Still, it is probably easier to just go for a portable carpet cleaning machine. If you need to clean rooms or the whole house, an upright carpet cleaner would be the appropriate tool. 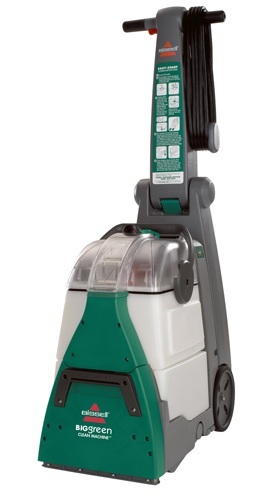 The only advantage to using a scrub brush and wet vac system is it allows users to scrub their carpets more carefully. Some people also use both systems – using a scrub brush first followed by a portable carpet machine that scrubs and suctions. Others like in the following example use a wet vac for auto detailing and cleaning auto carpets. 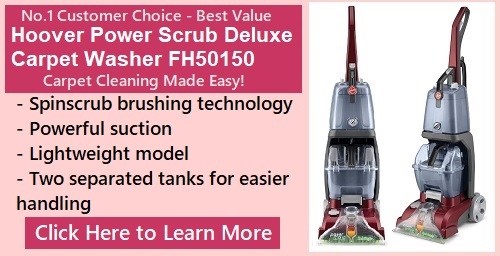 Remember that the user would also need to get a brushhead tool to scrub the carpets, a feature that is already built-in to carpet cleaning machines. 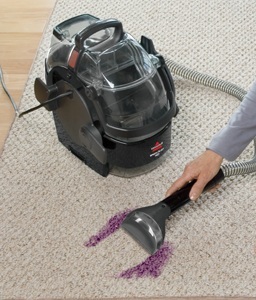 Some carpet cleaner machines have a spill pick-up mode that emulates what a wet vac does. In this mode, the scrubbing is not activated, but the water suctioning is active.